These 10 adventurous 500px photographers make our hearts race and adrenaline spike, feeding that wanderlust beast inside that won't be satisfied till we've jumped off, dived in, and explored every beautiful recess on Earth. Chris Burkard is a perfect way to start this list of undefinable photographers. Arguably the most undefinable of them all, he's photographed everything from Kayaking, to the Norther Lights, to Arctic Surfing. Adventure bleeds from each of his images. If you were holding one of his prints it would get all over you. Self-taught and based in California, Chris has, "established himself as a known name in the surf and outdoor industries, accomplished a deep body of work, held staff and senior photographer positions and has been recognized continually for his distinct creative compositions." To see more of Chris' work or follow along as he continues to explore remote areas and capture amazing images, follow him on 500px, visit his website, check out his Tumblr, or show him some love on Twitter and Facebook. Incredibly multi-fasceted, Kevin Winzeler's 500px account includes everything from studio portraits of athletes in action, to heart-stopping on-location work. Self-described as a "commercial photographer driven to INSPIRE ACTIVITY in a world that is far too sedentary," Winzeler's images do just that... and they do it for some really big names. His client list includes Adobe Systems, Columbia Sportswear, Skiing Magazine, and Skullcandy -- just to name a few. See more from Kevin by following him on 500px, visiting his website, or checking out his Facebook and Twitter accounts. Kirill Umrikhin is another of those photographers whose client list will make an adventure/sport junkie's eyes go wide. Quicksilver, Roxy, DC, Nike, Nissan, and Red Bull are all on the list. Of course, you take one look at his work and you understand why. Kirill is just as comfortable shooting skateboarders from the ground as he is shooting surfers from the water or snowboarders from the air -- he kind of does it all. To see more from this rock star photographer, be sure to follow him on 500px and then pay his website a visit for even pupil-dilating shots. Known best for his signature (and very mysterious... he won't share this amazing secret technique) light-painting sports photos, Dave Lehl is certainly no "one-trick pony." A quick browse through his 500px account or website will tell you that much at a glance. An action/adventure/lifestyle photographer based out of beautiful Denver, Colorado, his sports photography career began as a way to make some money on his way to a glitzzy fashion photography career in NYC. He stopped off in Summit County, CO to make a few extra bucks... and never continued his trip. He soon found out that although there were no big bucks, he had a better eye for capturing brats on boards than babes on beaches (plus snowboarding is damn fun!). He spent the next 7 years climbing the winter sports ladder, ultimately landing staff positions at Future Snowboarding Magazine, Rome Snowboards, and Sims Snowboards. See even more of Dave's amazing work by following him on 500px, or visiting his website and Tumblr. Having grown up in the mountains of Western Colorado, Lucas Gilman's sense of adventure was never far away. Again, it behoves us to list a few of Lucas' amazing clients and make the aspiring adventure/sports photographers salivate: Nat Geo, Sports Illustrated, ESPN Magazine, the New York Times, and Men's Fitness among others... and those are just his editorial clients. Traveling the world in search of untouched places and wild experiences, Lucas captures images ranging from kayaking in India, Brazil, Uganda and Costa Rica to backcountry skiing in Colorado, Jackson Hole, Wyoming, Alaska, and South America. To see more from Lucas, click the Follow button on his 500px profile, visit his website, or check him out on Facebook and Twitter. 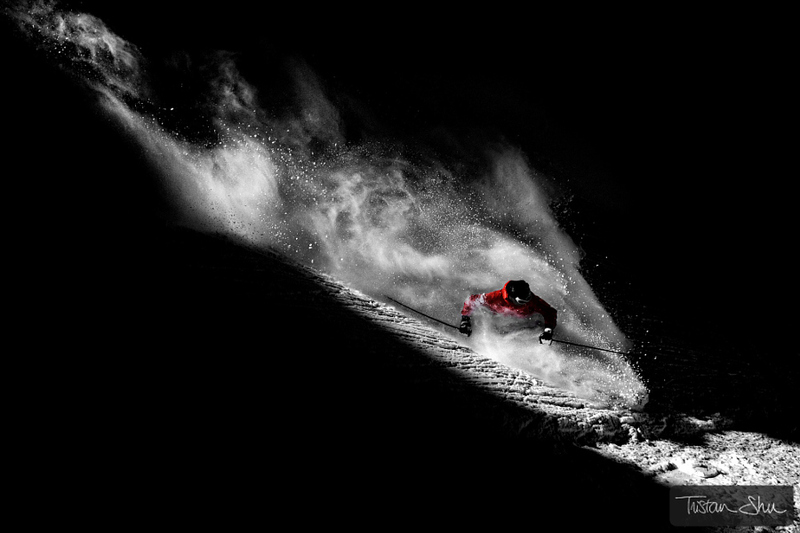 Mostly a snow-sports photographer, Christoph Oberschneider resides in Salzburg, Austria where he takes photos that'll have you reaching for your skis or snowboard. Not that his skill is limited to capturing people flying down a mountain with pieces of wood strapped to their feet -- he also photographs mountain biking, landscapes, and the occasional puppy -- but there's something about his winter sports photography that just sets you spine to tingling with anticipation and more than a dash of vicarious fear. To see more from Oberschneider, check him out on 500px, license his images through 500px Prime, visit his website, and then follow him on Facebook and Twitter. Let's take a little break from all the snow action and paddle out into the surf with photographer Jeff Dotson. If Chris' images make you want to reach for your skis, Jeff's will definitely have you planning your next trip to the beach and signing up for surfing lessons. Based out of Southern California, Jeff is an award-winning visual effects artist and director in addition to his skills as a photographer. As such, his images run the gamut between intense sports shots and incredible Photoshop creations. To explore the entire breadth of Jeff's work, follow him on 500px, pay his website a visit, or drop him a 140-character line on Twitter. A pharmacist by education, Adam Kokot doesn't exactly spend his days behind the counter at CVS. No, the award-winning photographer prefers to spend his time clinging to rock faces and trudging through the snow, camera in hand, amazing photos in memory card. The Polish photographer traces his start in photography to 2007, when one of his images was published in Mountain Climbing Magazine, but he's come a long way since then. He's now a member of the Phottix Pro Team and his accolades include awards from Red Bull and National Geographic. For more cliff-clinging photography, follow Adam on 500px, check out his website, or show him some love on Facebook and Tumblr. A newcomer to 500px, James Rushforth barely has 2 months to his account... but that doesn't make his work any less impressive. Like Adam, he tends to photograph people climbing things. In James' case this can be a rock wall, an ice wall, or a mountain... whatever you want to climb, he'll make you look good doing it. Follow James on 500px to see more of his work as he uploads. And if you'd like to learn more about the man behind the camera, check out his recent climbing guidebook on The Dolomites or give him a follow on Twitter. Tristan Shu, the man behind the headline image at the top, is probably the most prolific action/sports photographer on 500px. Seriously, try searching "extreme action" and sort the results by "max pulse" (or just click here)... he dominates the list. Based in the French alps, Tristan has already given us a glimpse into his incredible life when he was featured in our Day in the Life series. He's also made several of our Best Of lists, and one image of him at work even made it into our viral collection of 21 Photographers Doing Whatever It Takes to Get the Perfect Shot. To see more from Tristan, for the love of all that is adrenaline fueled, follow him on 500px. You can also find him on his website, Facebook, and Twitter. This article was originally published on the 500px ISO blog.